Born 4-12-41 in Washington, D. C.
Michael served in U.S. Marine Corps 1958 to 1962 .and the U. S. Army 1962 to 1978. During his military career he received numerous decorations and awards. These being: Bronze Star for Valor, 1st Oak Leaf Cluster; Meritorious Service Medal, 1st Oak Leaf Cluster; Army Commendation with "V" device and 4 Oak Leaf Clusters; Good Conduct Medal 6th Award; National Defense Service Medal; Expeditionary Medal; Vietnam Campaign Medal with 10 campaigns; Vietnamese Honor Medal; Gallantry cross with 2 Silver Stars and 1 Bronze Star; Vietnamese Service Medal; Combat Infantry Badge; Master Parachutist Wings; Ranger Tab; Pathfinder Badge; Vietnamese Ranger Badge; German Parachute Wings. Mike Smith 2Mike distinguished himself by exceptional meritorious service during 20 years or active military service. He served in key leadership position in both the Marine Corps and the Army during assignments within the United States, the Dominican Republic, Korea, Vietnam and Germany. As Operations Sergeant, Joint Exercise Division, Office, Deputy Chief of Staff, Operations, Headquarters Forces Command, be contributed greatly to the enhancement of the joint exercise program. After retiring from the military he entered civilian life where he became active with the Boy Scouts of America. During his career with the Scouts he was the Scoutmaster of Troop 303 and the first Scoutmaster of Troop 36, an Explorer Advisor to Explorer Post 3033 for three and one-half years, Leave No Trace Instructor, Ranger Trek Coordinator, C.O.P.E. Instructor, Director on numerous Camp-o-Rees, Brotherhood member of Order of the Arrow Lodge 243 Mowogo, Yona-hi Chapter Advisor; Woodbadge, and an honored camper. He earned these awards: Religious Award; Presidential Scoutmaster's Award of Merit; Scouter's Key; District A ward of Merit; Commissioner's Arrowhead Honor Award; Scout Leader's Training Award. 1958/1962 USMC, Honorable Discharge. 1962/1978 US Army, Retirement. 82nd Airborne Division, Ft. Bragg, N.C., Fire Team Leader, Recon Section Leader in the Dominican Republic. 2nd Infantry Division, Korea, Platoon Sgt. & Platoon Leader. Advisor to the Army of Vietnam (3 tours). Vietnamese Airborne Division, Platoon and Company Advisor . Senior Enlisted Advisor Vietnamese Ranger School. Company Commander Vietnamese Recon Company. Ranger instructor (4 tours): Mountain Ranger Camp, Patrolling Instructor, Tac Advisor. Senior Enlisted Instructor Mobil Training Team (responsible for reserve component and Desert Operations). Senior Enlisted Instructor City Operations. 10th Special Forces Group, Germany. Organized and operated a NATO School for Allied and US Forces. Operation Sergeant for the Deputy Chief of Staff for Operations at FORSCOM Headquarters, Ft. McPherson, Georgia. Assigned to Joint Training Exercise Division, which controlled operations worldwide involving all US military forces. 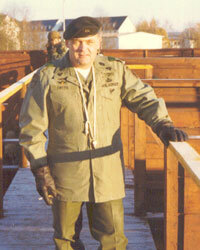 Retired 1978 as Master Sergeant (E8). Re-Enlisted 1991 US Army Reserve as Master Sergeant E8. Casualty Assistance, Ft. Mead. Maryland.